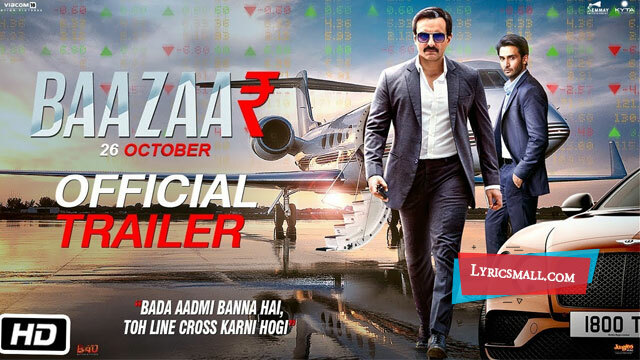 Baazaar Hindi Movie Songs Lyrics. Directed by Gauravv K. Chawla. Produced by Nikkhil Advani, Viacom18 Motion Pictures, Kyta Productions, Emmay Entertainment, B4U Movies under the banner Emmay Entertainment, Kyta Production, B4U Motion Pictures, Viacom18 Motion Pictures. Starring Saif Ali Khan, Radhika Apte, Chitrangda Singh, Denzil Smith, Rohan Mehra in lead roles. Music composed by Tanishk Bagchi, Yo Yo Honey Singh, Kanika Kapoor, Sohail Sen, Bilal Saeed. Song released under Times Music official label.